The Himalayan ranges stand tall in the northern parts of the country and are spread across the neighbouring countries too. 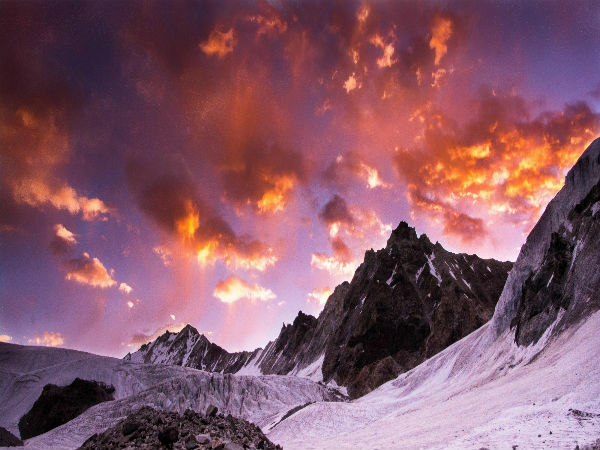 The majestic Himalayas is home to some of the tallest peaks in the world. These mountain ranges form a perfect getaway which offers a pantheon of activities such as trekking, paragliding, river rafting and much more. One finds a sense of peace and tranquility which is offered by these majestic ranges while walking through the lush greenery which is filled with blooming flowers. This is added on to by the brown leaves falling from the alpine forests. An expedition through these hills many not come very easy on your pockets; hence, we bring some of the pocket-friendly destinations to capture the beauty of the Himalayas. The Chandrakhani pass overshadows the hamlet of Malana which recently was declared out of bounds for tourists. The trail passes through small flowing streams and narrow ridges which makes it even more demanding as a trek. The pass also has religious importance as it was the place where Saptarishi Jamadagni is believed to have meditated for many years. The pass showcases one of the best scenic trekking paths which is filled with deodar, alpines, golden oaks along with many herbs and berries. One amongst the most scenic treks in the Himalayan ranges, which would enthrall you with its beautiful green meadows formed by oak and deodar trees, is the Deo Tibba pass, which is also one of the highest in the Pir Panjal cluster. This trek has a perfect combination of meadows, landscapes, alpine forests, sceneries and cascading waterfalls. One can also find snow-clad mountain peaks here which gives the place an apt nickname of Mini Chandratal. The trail to Bhrigu is home to steep narrow routes which are covered by huge boulders of snow, making it difficult at certain times.The trial passes through untouched forests along with an unconditional display of Mother Nature at her best. The lake gets its name from the Sage Bhrigu who is believed to have meditated here. One can absorb in the beauty of the valleys of Kullu and Solang as one proceeds through the trial. One of the lesser-known peaks of the Himalayan ranges is the Pangarchulla Peak. The trek to the peak begins from the well-known Kuari Pass trial and offers one of the most breathtaking views of the Nanda Devi peak. The trial takes you through blood-red rhododendrons, valleys in the hues of green and white along with woods of oaks, silver birch, blue pine and many more. Filled with deodar plantations, the Indrahar Pass is filled with dazzling water bodies, green meadows and forests of rhododendron. The trial gives you a glimpse of the Dhauladhar and Pir Panjal mountain ranges. One would be swept away by the beautiful views of nature's beauty which begins from the Gallu Devi Temple near Dharamshala. Sandakphu is one place which truly is heaven on earth, it is home to two of the world's highest peaks and offers plenty of options for one to camp at. The trek extends to certain parts of Nepal along with India as mountains do not have boundaries. One can see the peaks of Everest, Kanchenjunga, Lhotse and Makalu from the summit at Sandakphu amidst forests of rhododendrons along with blooms of magnolias. The Kuari Pass Trek is known as one of the impressive short treks in the Himalayan region which is perfectly crafted for beginners. The trekking path is heavily used by the local shepherds for grazing their cattle. As you reach the summit prepare yourself for breathtaking views of the Nanda Devi peak in its full glory. The Kedarkantha trek is one of Himalayan treks which flaunts its pristine beauty and gorgeous camping sites. One can catch the sight of snow covered peaks as you make your way through the trekking path which eventually ends with a jaw-dropping view of the beautiful summit in 360 degrees. The trek takes you to the lake of Roopkund which is known as the Mystery Lake and Skeleton Lake. The glacial trek is home to some amazing natural sites along with meadows. One would come across skeletons across the edge of the lake which is believed to be of a king and his army from the 9th century. As the name suggests the place is well known for its riot of colourful blooming flowers. The place is closely guarded by snow-capped mountains on one side and the Valley of Flowers spreads across another side which makes it a picture perfect destination. You would just be pulled you into it!